I would use full contour e-max for the best combination of strength, fit, and esthetics. IPS e.max, or lithium disilicate, is not a new material or system – it has been around for 20 years. It has evolved in terms of translucency to become far more user friendly, but the material has been with us for some time. For optimal results, you will need a nice shoulder/chamfer margin, (we have the best burs right here) with 2.0mm occlusal clearance. Delivery can be quick and easy with RelyX Unisem2. For a short prep, or to increase bond strength even more, use Multilink from Ivoclar. The cost is stable, margins are excellent, and layered porcelain can be basic or very customized. We hear the same rumors around the country about porcelain shearing off. From the podium that makes for interesting talk and I believe there really are improperly designed cases where unsupported porcelain fractures off, but we have completed over 50,000 units with zirconia frames over the past five years and know for a fact that the fracture rate is lower than with layered e-max or pfm. We are very careful about designing internal struts for support of the porcelain. In fact, our failure rate has been below 1%. 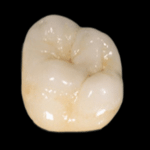 For bridgework e.max is not an option – porcelain to zirconia is your only choice besides pfm. Whether layered zirconia is “stronger” than e-max is subject to interpretation and several variables; I can only repeat that for us, it has been an excellent restoration that we do close to 1000 units a month with fewer fractures of porcelain that either pfm or e-max. So, my suggestion, use it with confidence whenever you need to. We stand behind it with a five year warranty, and we would not be using it if we did not have confidence. The big question is, what would I use in my own mouth? I have no crowns at this time, but I did two separate posterior units on my wife, and both are full contour IPS e.max. I chose that material for the strength, marginal fit, and esthetics. Ricky just recently had a cusp fracture off a molar and needed a crown. He chose IPS e.max full contour as well. 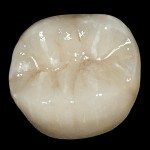 If I needed a bridge, I would use porcelain to zirconia over pfm. The fit is equal, the strength is equal or higher, and the esthetics will always be better. The customers that try it, love it. Are the esthetics as good as the other options, no, but we are talking about 1.0mm clearance on a second molar. The only other options would be metal ceramics or a full cast crown. Our full-contour zirconia crowns look much better than either of those options, cost about half as much, fit great, and will not break. What about cutting one off, or gaining endo access? Well, try cutting off IPS e-max, it’s no picnic either. The thing that makes these materials an option is their strength, so yes they are hard, but which is more likely to break the second molar from occlusal forces, or to need endo access? Frankly, with a new coarse diamond you will have no problem cutting through full contour zirconia, and you also do not need to worry about it fracturing. Try one, you will be surprised at the fit, and esthetics, and priced under $200.00, they are a great value. In fact, all the restorations I have been discussing here are priced at $195.00 complete. This is newer technology saving us time, money, and allowing us to offer metal free options that are not just equal to, but superior to traditional metal-ceramic restorations. More esthetic, stronger, quicker, and less expensive to fabricate, these materials are the future in dentistry Since you need 2.0mm for e.max, we virtually never see that on second molars, and a shoulder/chamfer is far more difficult back there. Our go-to restoration has become the full contour zirconia crown. 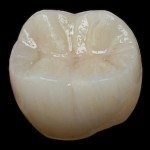 Yes, that is very similar to a Bruxzir crown, which is a patented name, but also a different material and process. We happen to think our material and technique is better for shading and contour, and the feedback from customers who have tried both has been in support of that. This entry was posted in Bay View Dental Laboratory, CAD/CAM Dental Technology, Dental Case Treatment Planning, Dental Laboratory, e.max, Zirconia and tagged Dental Materials, e.max Crowns, Full Contour Zirconia Crown, Lithium Disilicate, PFM Crown, Pressed Crown, Zirconia Crowns. Bookmark the permalink. Signup with your email address to receive updates about new blog posts.